Below are some of the credible tour and travel companies with their addresses and contacts in Uganda and Rwanda, organizing memorable safaris and tour packages to see the mountain gorillas in Bwindi Impenetrable Forest, Mgahinga National Park and Volcanoes National Park Rwanda. 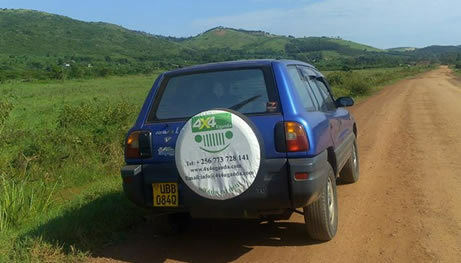 Offering self drive car hire services in Uganda and Rwanda. Have very good cars, well maintained and regularly serviced by Toyota Uganda. 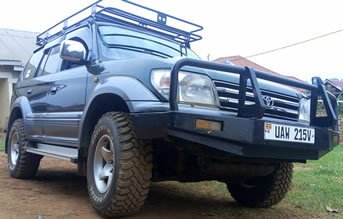 Our fleet includes 4×4 vehicles like Toyota Rav 4, Land cruiser Prado TX, TZ, GX and 3.0 Liter, Land Cruiser Hard Top, Nissan Double Cabin and Land Rover Defender. Managed by Mr. Ngarambe Vincent, offering fantastic safaris and tours in Rwanda for groups, single travelers, business travelers, couples on honeymoon and families. Our Destinations inlude Volcanoes National Park for gorilla tracking, Nyungwe Forest for primates and Akegara National Park wildlife as well as historical and genocide memorial sites around Rwanda. Ugandan based company with its main headquarters in Kampala (Uganda Capital), and a sales office in Kigali (Rwanda capital). We mainly offer gorilla trekking tours in the impenetrable forests of Bwindi National Park, Mgahinga and Parc National Des Volcans Rwanda, primates safaris, Mountain hiking, community tours, Cultural excursions, wildlife viewing and fantastic boat cruise among others in all East African Countries. As the name suggests, we are specialists in mountain gorillas in Volcanoes national park Rwanda. We offer gorilla tracking tours, gorilla filming and we organize dinner with gorilla doctors, golden monkey tracking, adventurous hike to Dian Fossey Tombs, community excursions and Musanze caves exploration. We extend our operation into Uganda, Kenya, Burundi, DR Congo, Tanzania and Zanzibar for beach holidays, hunt for Big Five animals in Africa (Lion, Leopard, Elephant, Rhino and Buffalo), hot air ballooning and boat cruise, etc. Visit rwandasafarigorilla.com for details. Offering fantastic gorilla expeditions in Uganda, Rwanda and Democratic Republic of Congo to Groups, Single travelers, business travelers, families, photographers, etc. Book your dream safari to see the gorillas in the wild with Gorilla Expeditions ltd, you will not regret! Specialists in Rwenzori Mountain climbing adventures in Uganda to major peaks such as Margherita (Mount Stanley at 5,109 m /16,762 ft above sea level) or Weismans peak. We also offer trekking excursion to Mount Elgon in Eastern Uganda, gorilla trekking in Uganda and / or Rwanda. Works under African Jungle Adventures, one of the premier tour and travel companies in Rwanda. The company provides amazing safaris to see the mountain gorillas and golden monkeys in Volcanoes national Park. We offer more gorilla tracking tours in Bwindi Impenetrable Forest in Uganda and Virunga National Park in DR Congo. Among other adventurous activities such as Mt. Rwenzori hiking, Big game viewing, Chimpanzee tours and Mountain Nyiragongo and Nyamurangira trekking in DR Congo. Specialists in Luxury gorilla safaris in Rwanda and Uganda, the best 2 homes for mountain gorillas in the world, with one of the finest safari lodges in Africa namely; Virnga Lodge in Volcanoes national park Rwanda, Gahinga Lodge in Mgahinga gorilla park, Bwindi Safari Lodge in Buhoma and Kyambura Game Lodge in Queen Elizabeth National Park. For a very long time, Abacus Africa Vacations is providing excellent wildlife tours in East Africa (Uganda, Rwanda, Burundi, Kenya, Tanzania, Zanzibar) located in Kampala with offices in Nairobi Kenya and Kigali Rwanda.